THE narrative of Tibet has never lacked for commentators and those willing and eager to tell its story on its behalf. Beginning in the twelfth century, the land, its culture and its people have been scrutinized and written about by a steady stream of explorers who managed to breach its defences and sneak into the remote Himalayan kingdom. These accounts, and those who braved the land of snows to gather them, became invaluable in the nineteenth century when secret spying and mapping missions were despatched to Tibet, as the Great Game began to unfold in Asia. Its strategic location, its geopolitical importance, and its exotic appeal as a sort of a last unexplored frontier, ensured that Tibet remained an area of interest for ‘outsiders’ who commented upon it, told and retold its story, and continued to add to the body of writing on it, even as it passed into an era of turmoil and occupation by the People’s Republic of China in the twentieth century, and a section of its population fled their troubled homeland. What is interesting is that a large part of this body of work on Tibet, scholarly, literary and otherwise, was written by non-Tibetan ‘experts’. As the Buddhism of Tibet, represented most prominently by Tenzin Gyatso, the fourteenth Dalai Lama, began to gain currency as a credible spiritual path in the western world circa 1970s and ’80s, a new wave of writings emerged. A host of Tibetan Rinpoches became popular teachers and began travelling the world, setting up centres and acquiring students who were affected not only by their teachings of the dharma, but also by their joie de vivre in the face of adversity. The writings that emerged from the dharma’s interaction with the world, most notably the West, are a testimony to its ability and willingness to converse with new perspectives and worldviews that were quite different from its own. So, the world fell in love with the Thunderbolt Vehicle to enlightenment (Vajrayana Buddhism) taught by affable, ruddy-cheeked Rinpoches, leading to a ‘dharma publishing’ phenomenon. Glossy-backed books on personal growth, often compilations of teachings given by a Tibetan teacher, began appearing on bestseller lists. Though I have never heard or seen any Rinpoche actively reinforce a Shambhala-esque view of Tibet, either in lectures or in their writings, the fact that there had existed this very practical system of mind-training in Tibet, preserved and practised by human beings, who stood before the world and whose equanimity was palpable, did add to the halo of spiritual accomplishment around Tibet. I wouldn’t say it further exoticized Tibet, but it did lead to a somewhat distorted popular perception of the country – that it was a paradise, disturbed but nevertheless idyllic, filled with enlightened, angelic maroon-robed monks. This is why Bhuchung D. Sonam’s writings, along with those of a small but growing group of Tibetan writers within and outside Tibet, become so crucial. Along with the older Lhasang Tsering and Jamyang Norbu, writers like Sonam, Tenzin Tsundue, Woeser, Jamyang Kyi and others, are engaged in intently surveying and mapping the spectrum of the contemporary Tibetan experience – that ranges from repression at home in Tibet, to a ‘stateless, homeless’ existence as refugees in India and other parts of the world. 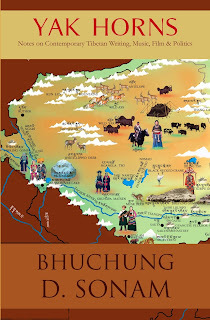 Bhuchung D. Sonam’s Yak Horns is a collection of the author’s writings – essays, literary criticism, film and music reviews, et al – that have appeared in journals, the author’s blog at burningtibet.blogspot.in, and on websites dedicated to Tibetan writing, like www.tibetwrites.org. Through the diverse topics he tackles in the book, Sonam amplifies the voice of an entire generation of Tibetan refugees – those who grew up in exile, never quite at home, assimilating in their adoptive homelands yet never free of the persistent remembrance of the true one they had never seen. In this, Yak Horns presents an invaluable insight into the soul of the young refugee, whose ‘permanent address has been stolen’, as Sonam’s biography in the book so poignantly states. The collection of articles and essay in Yak Horns also serves as both a mirror of, and a commentary on, the contemporary Tibetan cultural and literary scene. Those who may not regularly read the blogs and magazines where these articles appear will find in this book an opportunity of a snapshot of the same delivered to them, which suffices as a useful introduction to contemporary Tibetan perspectives and realities. Sonam is an intrepid chronicler, and little seems to have escaped his prolific pen in the years represented in the book. What one also gets is a sense of the secular literary and cultural traditions of Tibet, through his cataloguing of the works of individuals such as the inveterate traveller and controversial writer of the early twentieth century, Gendun Choephel, who could be seen as a precursor to the secular Tibetan intellectual movement of which Bhuchung D. Sonam is a contemporary representative and to which he owes allegiance. Along with past intellectuals, Sonam keeps his lens trained on the contemporary community of writers within and outside Tibet. For those within Tibet, writing and blogging have proven to be a crucial means to resist mounting repression by a paranoid state-machinery wary of Tibetan insistence on a unique and distinct nationhood, identity and culture. By telling the truth about what is happening in Tibet, one that is often at variance with the ‘official’ version, they risk imprisonment, torture, loss of careers and separation from loved ones. A case in point is Jamyang Kyi, a journalist employed with the state-run Qinghai Television, whose account of her imprisonment in the aftermath of the widespread protests in Tibet in 2008, was smuggled out of the country and published as a book in exile, titled A Sequence of Tortures: A Diary of Interrogations. This happened after the blog where her account first appeared in 2008 was taken down. Another prolific, and fearless, blogger is Tsering Woeser, who lives and works in Beijing and has often spoken about the ‘imperialist cultural invasion’ of Tibet. Despite repeated curbs and threats to her freedom, she and her husband, the author Wang Lixiong, continue to post content on-line that attempts to reflect ground realities in both Tibet and China. Indeed, it is a pledge that resonates through this book and the many paths it traverses, the many stories it tells, and the one homeland it pays homage to – Tibet.